by Zohara M. Hieronimus, D.H.L. Fig. 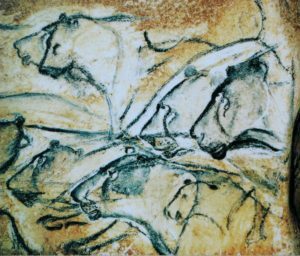 3.4 Chauvet-Pont d’Arc Cave painting of lions. Ice Age art from approximately 32,000 BCE. 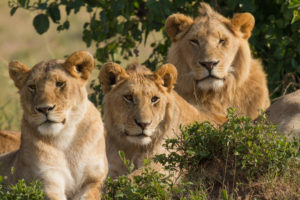 Portrait of three lions (one female and two males) of a pride, all resting one morning. Taken in the Maasai Mara Reserve in southwest Kenya, January 23, 2012. By Benh Lieu Song. J. Zohara Meyerhoff Hieronimus, D.H.L., is an award-winning radio broadcaster, social justice and environmental activist, and professional artist. She founded the Ruscombe Mansion Community Health Center in Baltimore in 1984. She hosted the national radio program Future Talk until 2008 and cohosts 21st Century Radio with her husband, Robert Hieronimus. The author of several books, she lives in Owings Mills, Maryland. With over 55,000 unique visitors each month, Wisdom’s website offers dozens of articles, columns and book excerpts updated every month, an extensive and dynamic Calendar of Holistic, Educational, Spiritual and Metaphysical Events, Holistic Classified advertising, a searchable Holistic Resource Directory, regularly updated Educational Programs in Holistic, Health, Metaphysical and Spiritual subjects and modalities, Retreats and Sacred Travel listings and more. Wisdom’s website is one of the most popular sites of its kind on the web.